Hess’ Law states that when a reaction involves more than one step, the sum of the individual reactions will yield the overall chemical equation for the net reaction. The same, then, can be said of the respective enthalpies (ΔH) of each of those reactions. The sum of the ΔH for each reaction or step will equal the net enthalpy for the overall reaction. For example, the reaction to form NO2, a very common gas, may seem very simple since nitrogen dioxide is composed of 1 N atom and 2 atoms of oxygen. How complex can that be? Well the formation of NO2 actually requires several compounds and three different reactions to occur in sequence. Each reaction in the series has its own ΔH associated with that reaction. When all the reactions in the series are added together, they should total the overall reaction. Therefore, each of their respective enthalpy (ΔH) values will be added together to attain the overall enthalpy for the reaction as a whole. 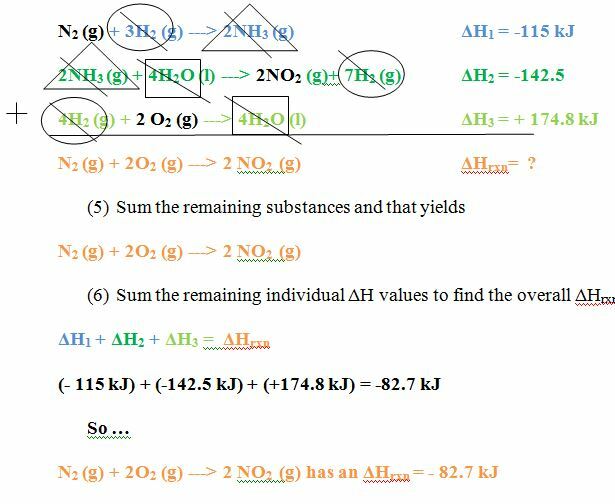 (1) Circle all substances that should appear in the overall equation. (2) Analyze the position (reactant or product) of each substance you need to remain in the overall reaction. Find a way to place the substance in its appropriate position. This may require reversing the reaction to move the substance from reactants to products or vise versa. If the substance is where it needs to be in the final reaction, then no action is necessary. Steps 1 and 2 do not appear to need any adjustment in placement. However, Step 3 has O2 in the products whereas O2 should be in the reactants when the overall equation is examined. Step 3 should therefore be reversed! (3) Next analyze the number of moles (coefficients) of each substance required to be in the overall chemical equation. Again, it appears 1 N2 and 2 NO2 in the overall equation. However, 2 moles of O2 are needed. We can change the # moles of each substance by multiplying the entire equation including the ΔH by a factor that will yield the required # moles. Since there is ½ coefficient in front of O2­ and 2 whole moles are needed, the entire equation including the ΔH should be multiplied by a factor of 4. 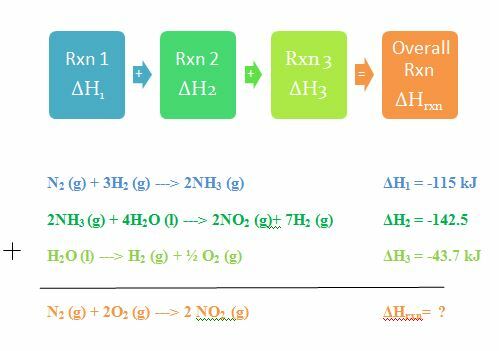 (4) Finally, add all the equations in the series eliminating like substances on opposing sides of the arrows (reactants cancel products in any of the reactions). Hint: 1 mol of each substance can eliminate 1 mol of another.